Driving an electric cars is serenity, what’s “peace of mind” worth to you? Altruism – Saving the World at What Cost? What is it worth to avoid future climate change and environmental catastrophes? What’s your share of the cost of the global oil war? Don’t electric cars freeze up in Winter and become useless? Biofuels – carbon neutral? sustainable? Will we get freedom from oil through fuel efficient cars and trucks? 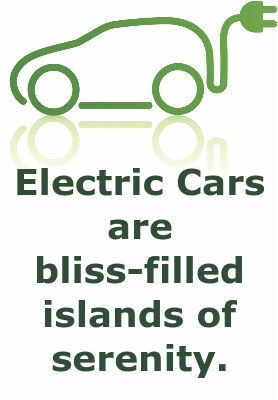 Because they&apos;re quiet, and there&apos;s no engine with a couple thousand explosions a minute, electric cars have a soothing effect, which should produce positive wellbeing benefits. What’s the value of our wellbeing? How valuable would be transforming cities from obnoxiously loud places, to a calm zone of tranquility? According to the World Health Organization (WHO): "Excessive noise seriously harms human health and interferes with people’s daily activities at school, at work, at home and during leisure time. It can disturb sleep, cause cardiovascular and psychophysiological effects, reduce performance and provoke annoyance responses and changes in social behaviour." These studies recognize noise impacts are not always readily obvious. Human nature being what it is, when a threat isn’t readily obvious we tend rationalize it away and say it’s not a problem. In other words, most people ignore noise pollution but that doesn’t mean its not a problem and that we don’t have to collectively suffer excess noise in our cities. One connection is disrupted sleep, which can make us more tired than we should be. That’s not safe on the road, and could lead to a greater incidence of traffic accidents some of which will be fatal. The noise itself is a mental burden, and causes irratation or communication problems. Traffic noise is the primary source of noise fatigue. Some of the noise is unavoidable, like tires on the pavement, but other traffic noise comes from engines. The very nature of internal combustion engines is noisy, despite all the effort by automotive engineers to reduce noise and vibration. An operating engine sustains several thousand explosions a minute, which of course will produce noise and vibration. The EFTE recommendations are to reduce traffic speed (reducing engine noise), reduce traffic (reducing engine noise), change road surfaces to be less noisy, quieter buses and trucks (switching to quieter engines), smoother traffic flow to keep engines from emitting start/stop noise, and switch to inherently quieter vehicles. Most of these recommendations focus on ways to reduce engine noise. Electric vehicles are inherently quiet without requiring any extra measures to mitigate noise. Instead, they’re naturally quiet, and free from vibration. It’s pretty obvious a large-scale switch to electric vehicles would make our cities quieter, and we’d all have less noise to suffer through.